The Video and Embedded Evaluation Kit-Multi-touch, Second Edition, on Cyclone® V SoC Development Board (VEEK-MT2-C5SoC) is a comprehensive embedded design environment with everything developers need to create processing-based systems. VEEK-MT2-C5SoC delivers an integrated platform that includes hardware, design tools, intellectual property (IP) and reference designs to develope embedded solutions for a wide range of applications. The fully integrated kit allows developers to rapidly customize their processor and IP to best suit their specific application. 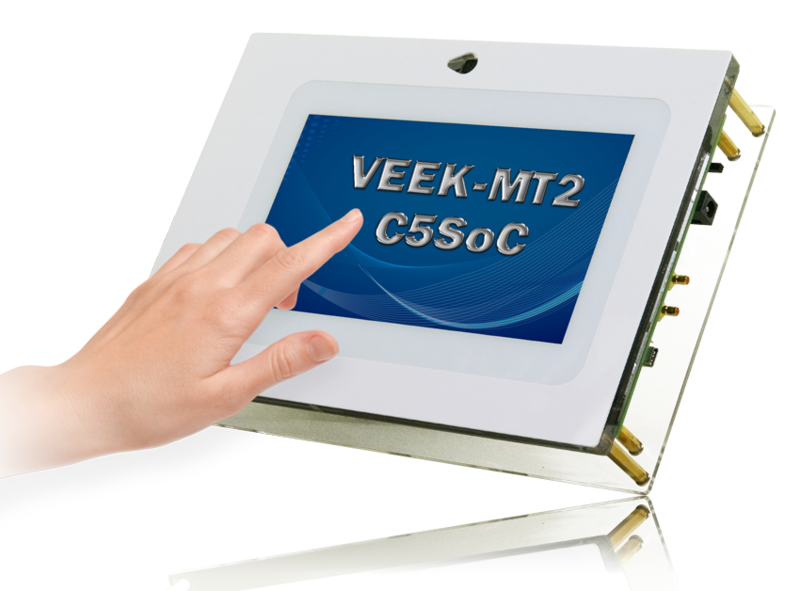 The VEEK-MT2-C5SoC features the Intel Cyclone® V SoC development board with Intel Cyclone® V SX SoC FPGA, and a capacitive 7” TFT LCD with 800x480 resolution which supports 5-point touch and multi-touch gestures. An 8-megapixel digital image sensor with auto focus, ambient light sensor, Gyroscope, Magnetometer, and 3-axis accelerometer makes up the rich feature-set. The all-in-one embedded solution offered on the VEEK-MT2-C5SoC, in combination with the LCD touch panel and digital image module, provides embedded developers the ideal platform for multimedia applications with unparallel processing performance. Developers can benefit from the use of this FPGA-based embedded processing system utilizing mitigating design risk and obsolescence, design reuse, reducing bill of material (BOM) costs by integrating powerful graphics engines within the FPGA, and by lower costs.